Systat Software proudly introduces SYSTAT 13, the latest advancement in desktop statistical computing. Novice statistical users can use SYSTAT’s menu-driven interface to conduct simple analyses and produce beautiful 2D and 3D graphics for presentations or reports. SYSTAT 13 is quicker, sturdier and more robust than any of its predecessors. Newly improved data handling functionality allows the software to process larger data sets, at speeds faster than ever before. 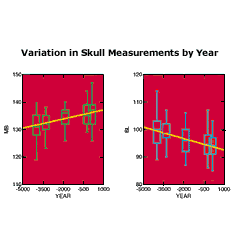 SYSTAT®‘s MANOVA procedure found significant variation between time periods in these measurements of male Egyptian skulls. The multivariate results are corroborated by the univariate ANOVA depicted here in these combined Regression/Box Plots. These survival plots show the effect of four levels of TCE contamination on Vallisneria Americana. 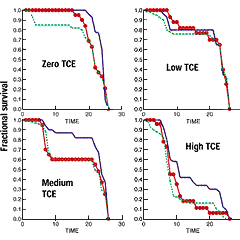 The plots clearly show that higher levels of TCE reduce the survival rate across all genders. SYSTAT® lets you combine geographic and statistical data to create insightful maps. 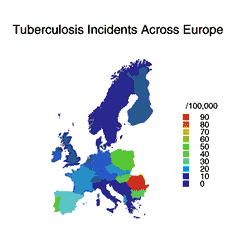 This plot uses color coding to highlight high incidence rates of tuberculosis across Europe. Potential Uranium reserves are modeled using SYSTAT®‘s spatial statistics Kriging estimator. 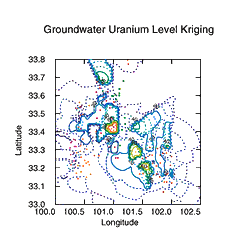 This Krig contour overlaid with actual Uranium levels indicates that the largest concentration is located in the area near longitude:101; latitude: 33.4. SYSTAT® helps keep track of your manufacturing process. 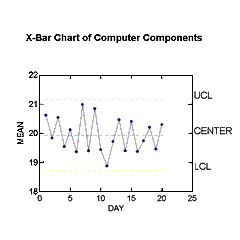 Here, an X-bar QuickGraph shows the average resistance of five randomly selected computer components measured over twenty production days. The X-bar shows the components well within control limits. 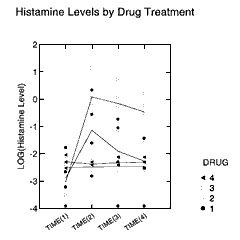 Repeated measures ANOVA was used here to investigate the effects of four different drug treatments on blood histamine levels in dogs. 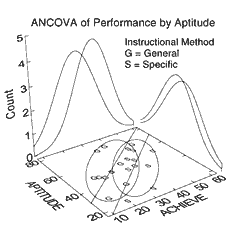 Analysis of Covariance (ANCOVA) was necessary to adjust for the effect of basic aptitude in this experiment comparing the effectiveness of two different instructional methods. 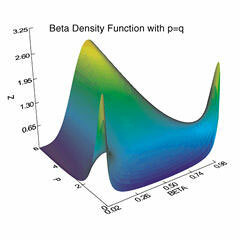 Compare theory to experiment with SYSTAT®‘s built-in statistical functions, such as this beta density. SYSTAT® offers density, cumulative, inverse and random number functions for 13 distributions.